Amit Agarwal of Digital Inspiration has created manyÂ handy tools and shares great tips on his blog.Â His TallTweets tool was originally created to create very long twitter posts. Enter your text and TallTweets parses it out into a bunch of connected tweets and posts them for you. 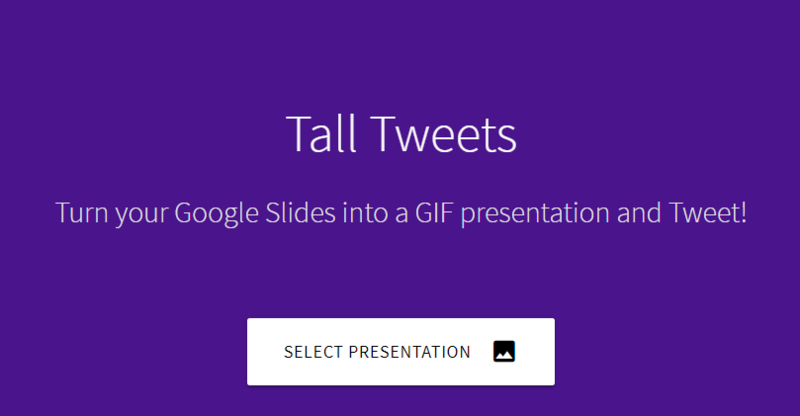 Now that Twitter has added that feature, TallTweets has been repurposed to create gifs from Google slide decks. Tony Vincent created the nifty math exampleÂ below and covered more ideas in an Instagram post. This gif was created from a presentation slide deck. Timing can easily be adjusted for each individual slide. It’s one way to easily share a slide presentation and embed it in other web pages, blogs, documents, etc.Â This could even be used as the slide deck prompts for a pecha kucha style presentation! The tool has options for saving a gif to your computer and to easily share it via twitter. Like any other gif, it can also be incorporated back into a Google slide presentation. Giving a talk? Create a gif that has some introductory info that can run on the screen before you get started. Save screenshots of a tool you need to demo. Pop them into a Google slides deck. Add any arrows, callouts or other needed explanations and create a gif in Tall Tweets. Go to TallTweetsÂ and select your presentation. You’ll need to authorize access to your Google Drive the first time. Wait while the slides are processed, which can take a while for a big slide deck. You can change the duration of each slide and a few other tweaks. Download and/or tweet right from the preview. And of course, you can create annoying, goofy stuff too. This is so cool! Thanks for sharing! I’d love to see students use it to create 10 second book trailers. I’d also use it to share keywords from presentations–imagine presenting why libraries matter to a school board with a gif full of library activities!